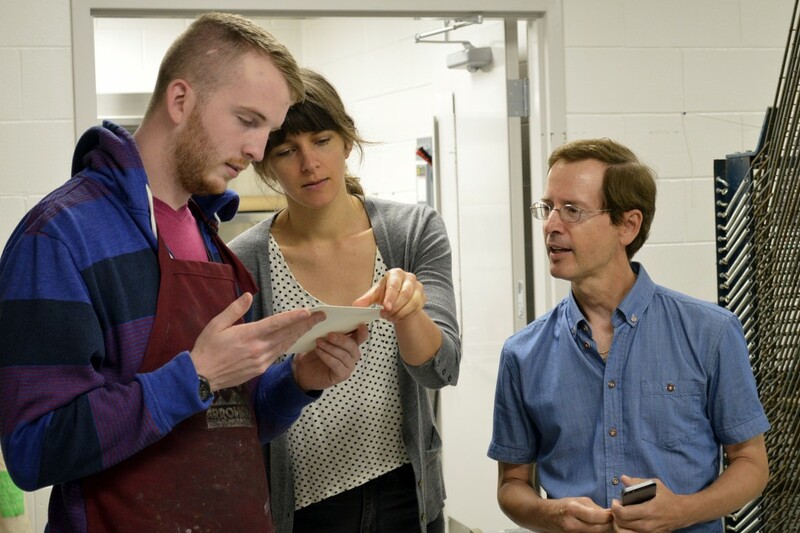 Landon Perkins, Allison Milham and Jeff Peters review a print from the “WPA project”. Last December, Small Craft Advisory Press (SCAP) hosted book and letterpress artist, Jessica Peterson, who led twenty-four artists and writers in the planning stages of a collaborative artists’ book. The collaborators then worked on writing and imagery throughout the spring and a number of them returned to FAR for the printing phase of the project in June. This work is a response to the Federal Writers’ Project of the Works Project Administration (WPA) in Florida and is the third in a series of Florida-inspired pieces produced by SCAP. The Facility for Arts Research hosted the opening reception of Quarto: Four Years of Artists’ Books by Resident Artists at the Small Craft Advisory Press, which featured a gallery talk by AB Gorham. This exhibition showcases the book art of Bridget Elmer, Allison Milham, Michelle Ray and AB Gorham, participants in the Small Craft Advisory Press Resident Artist program.